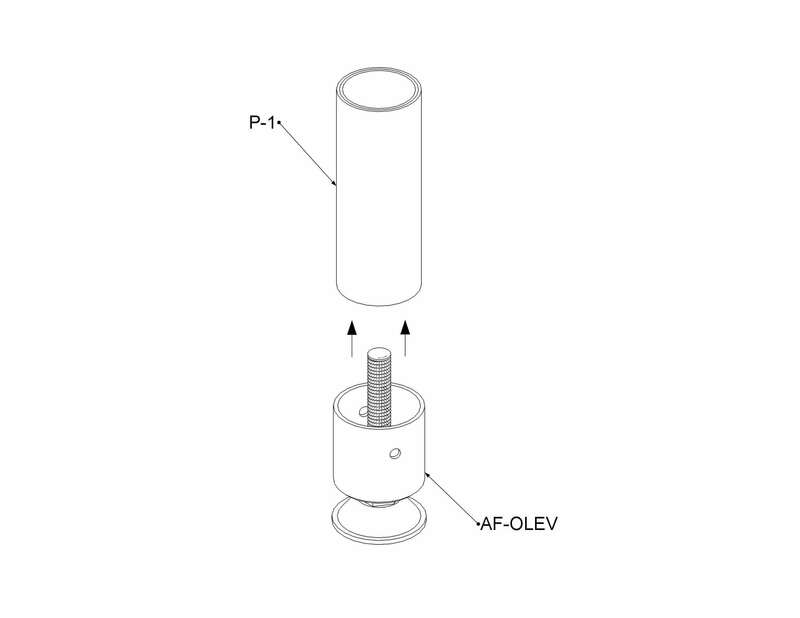 The AF-OLEV is an adjustable metal foot used with stainless steel pipes and 2mm thick pipes. This part comes in handy for structures that rest on an uneven floor. This foot can be adjusted up to 1 15/16 inches. The foot is installed outside the pipe and is only compatible with the EP-96-ST and with 2mm thick pipes. The use of the AF-OLEV has been tested to assure complete stability at all times. The main goal of the AF-OLEV is to adjust a structure's height on uneven flooring to prevent leaning. The bottom of the foot is smaller than the AF-ILEV and does not have a straight side. This bottom side is small enough to avoid needing extra space between the structure and its environment but big enough to provide all the needed stability. The AF-OLEV is mainly used in the creation of flowracks and workstations. This foot should be avoided on soft surfaces and replaced by the AP-ICAP or AF-RUB. 2- slightly insert the AF-OLEV inside the P1 pipe. 3-Push completly the AF-OLEV inside the P1 pipe with the help of a mallet.